It seems that the Irish were born to celebrate; just look at St. Patrick's Day, weddings and even wakes for the fun evidence. Christmas is certainly no different, and while it is a religious season, it is also a time for merriment and festivities that have developed many time honored Irish traditions. In the late 16th Century, England imposed Penal Laws in Ireland which effectively outlawed the Catholic Church and the Catholic Mass. The faithful Irish did not think well of these English mandates and a candle was placed in the front window of a home to indicate to others that this was a safe place for priests to perform Mass. The meaning of the candle in the window, that was traditionally lit by the youngest member of the family, has since evolved into a welcome sign for the Holy Family; it can also represent the love for a family member who cannot be home at Christmas. 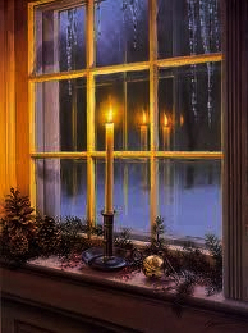 It is now common to see the front windows of Irish homes lavishly decorated with several electrical candles and lights at Christmas time. This once exclusively Irish Christmas tradition has now transcended to Christians throughout the world. Another candle related tradition is the lighting of an Advent wreath. Advent starts on the fourth Sunday before Christmas and ends on Christmas Eve. With each ensuing Sunday during the Advent season an additional candle is lit in preparation of Christ's birth; each week has its own theme: hope, peace, joy and love. 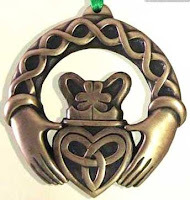 The Irish Gift House features Advent wreaths with Celtic knots; for additional illumination we also have an assortment of light up Irish angel tree toppers too. Throughout the world, no matter how much they intended to go more often, many Christians go to church only at Christmas; sometimes even the faithful in Ireland fail to go to church every week. It is an annual tradition on Christmas Eve to attend midnight mass and the Churches in Ireland are full to capacity. For many Irish, the Midnight Mass is a social event shared by friends and family as much as it is religious celebration. Friends will visit with prayer, the singing of Christmas Carols and some good conversation. Just before going to bed you will want to leave the traditional Irish treat for Santa Claus. No it is not milk and cookies but a pint of Guinness and a mince pie. 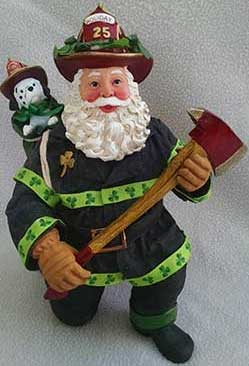 By the way, The Irish Gift House has a grand selection of Irish Santa figurines. For many generations the holly wreath has been traditionally placed on Irish front doors during the Christmas season. While many in Ireland's past could not afford store bought decoration, even the poorest of the poor could afford to gather the abundant sprigs of holly and every home was decorated with a holly wreath. In Celtic mythology, the holly was the sacred twin of the oak tree; the deciduous oak was the controller of the sunny summer months while the evergreen holly controlled the dark balance of the year. The Druids believed the holly to own shielding characteristics that offered protection against evil spirits and magical powers. Celtic lore believed that bringing the leaves of the holly tree inside during the cold months would provide sanctuary from the winter chill for the wee fairy folk, who in return would be generous to those who lived in the home. Christians have also given the holly tree special reverence as it is believe that holly formed part of the crown of thorns worn at the crucifixion and it was Christ's blood that gave the holly berries their red color. Christians are also credited for giving the holly tree its name which was derived from the word holy. Decorating with a wreath on your door is another Irish Christmas tradition that has evolved to become common for Christians throughout the world. Please visit our Irish Christmas Decorations category at theirishgifthouse.com for additional ideas that include several hundred Irish Christmas ornaments and on their own separate page, the Belleek ornaments. We also have an assortment of Irish Nativity scenes and ornaments along with a collection of Irish nutcrackers. The Irish Gift House is your one stop Irish Christmas shop!